G.I. 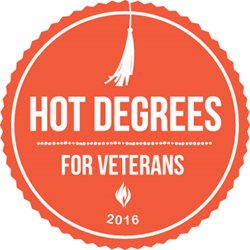 Jobs® today released its 2016 Hot Degrees for VeteransTM (http://www.gijobs.com/2016-hot-jobs-cool-degrees/), featuring the Top 30 post-secondary degrees, certificates and licenses veterans need to enter today’s hottest job fields. Victory Media, publisher of G.I. Jobs® magazine and the list, surveyed hiring managers from more than 200 Military Friendly® Employers (https://militaryfriendly.com/2016employers/) to identify the leading degrees for veterans and members of the military making the shift to civilian life. “Our Hot Degrees for Veterans™ is more than education; it puts positive employment outcomes in high-demand job fields first.” Daniel Nichols, Chief Product Officer and Navy Reserve. The 2016 Hot Degrees for VeteransTM list includes traditional four-year bachelor degree programs as well as “fast track” options, such as two-year degrees and professional certifications. “Our Hot Degrees for Veterans™ is more than education; it puts positive employment outcomes in high-demand job fields first,” continues Nichols. Publisher of G.I. Jobs®, Victory Media is a service-disabled, veteran-owned business serving the military community since 2001. G.I. Jobs® is the premier brand in military recruitment and free guide to opportunities from classrooms to careers for the military community. Follow G.I. Jobs® on Facebook at http://www.facebook.com/GIJobsMagazine or Twitter: GIJobsMagazine. Since 2001, Victory Media’s Military Friendly® tools have helped thousands of schools and employers get their opportunities in front of veterans as they enter the civilian world. Each year, Military Friendly® ratings provide service members the objective data they need to evaluate how companies and colleges stack up in the recruitment, hiring and support of military veterans. Visit http://militaryfriendly.com for more information about Military Friendly® survey criteria and methodology, tools and resources.